The following review was submitted by Disturbedguy, one of our regular contributors at HEXUS.gaming. The opinions expressed in this review are his own and not necessarily the views of the HEXUS team. 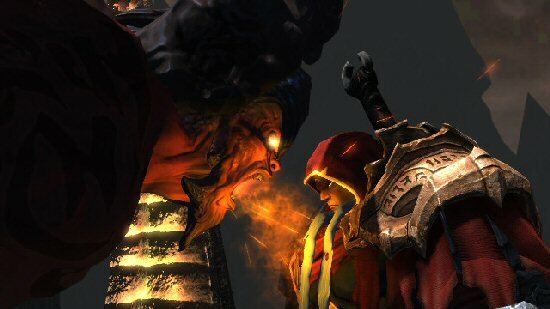 Darksiders is like many games on the market at present, the most recent of which is Dante's Inferno. It’s your typical hack and slash type of game, with upgrades obtained along the way as you improve your weapon skill. You play as War, one of the legendary horsemen who answers the call to go to Earth and wage war, only to be betrayed and end the human race as we know it. As you can see a lot of the time within this game has been spent travelling between areas to complete missions, it may look as though that is a lot of wasted time, but along the way there are fights to be had, chests and artefacts to find, the latter two bringing rewards. The boss fights seem to vary between incredibly easy to rather hard, no boss is beaten using the usual hack and slash method, with each boss there are certain ways of stunning the boss allowing you to inflict massive amounts of damage. The graphics are simply some of the best I have on a PS3 game and the amount of detail that has been put into each area you visit is simply amazing and jaw dropping. e to be its main rival, Dantes Inferno. The game can become a bit easy when you unlock chaos form and although there are a variety of attacks, I find myself using the same attack combo's over and over again, which can become a little boring. The travel can become somewhat boring at the beginning of the game, eventually you will find merchants known as Vulgrims that allow you to buy upgrades, health, weapon upgrades and other bits for War as well as allow you access to a fast travel system or as you unlock later on, you get your horse named Ruin which helps you travel faster but also adds a little extra punch to your attacks. If you'd like to contribute to HEXUS.gaming and have a short review of your own published then please visit this forum. Read the rules, check to see whether the game you want to review is included in the list and then simply write it up on the forums. You'll have to be a registered user to join in, but it only takes a minute to join. We're still accepting reviews for Darksiders, which will be added to this article. The dungeon crawlling and puzzles arent ever of the “Water Temple in Ocarina of Time” level, but thats not a terrible thing either. From start to finish, its a nice play, never really drags, and is always great to look at. Seeing as its been out a while now, its probably available second hand now, so becomes even more of a bargain.